This is the discussion page for the improved diff for Wikipedia article revisions wikEdDiff and its diff library wikEd diff. Feel free to leave your comments, suggestions, and bug reports at the end of this page. 24 "Use of "wgServer" is deprecated. Use mw.config instead." 29 Trouble report: wikEdDiff is erroneously reporting "no difference"
35 Is It Possible for wikEdDiff to Show Differences Without Wikitext and HTML Markup? 38 Highlights in old and new versions? Due to recent changes, diffs with no content are collapsed to the left. I was excited to see the new version of WikEdDiff. Love the new way of showing moved text and the fact that it shows this Honda Accord diff perfectly. I thought I would share with you two diffs that may help you tweak the code. Foldamer diff currently has a false positive on a moved block and an example of where showing a single-character change would simplify the diff. Tom Jones diff has record companies reordered in the infobox but these aren't detected. Eliminating the false positive in the Foldamer diff while enabling detection of the moves in the Tom Jones diff sounds like a big ask but I thought I'd see what you made of it. Hi Cacylce. The Tom Jones reordering is working nicely now. I am still getting a false positive on references in the Foldamer diff (and in the Tom Jones diff!) Does this mean that bug fix hasn't been rolled out? User:Cacycle/diff.js says you are on version 1.0.13. Logistic regression diff has a definite false positive around "is usually ... defined as ... ,". There are also some false positives around shared text that is not shown as moved. Phrases like "or more" or "of the" appear in white in the middle of of large patches of blue or orange. Does the algotithm currently seek to reject this sort of thing? Loose coupling diff doesn't detect some cases where single-character changes would simplify the diff. Hi Cacycle. The loose coupling diff is now looking good. The Logistic regression diff has fewer of the single white words but it is still has some false positives, including "is usually ... defined as". 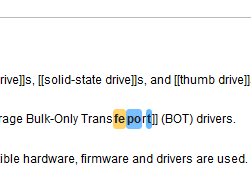 Also, I have noticed that the Tom Jones diff now has a false positive on "<ref>" (but not "</ref>", strangely). How do you work out what to reject? Is there a formula that includes the distance moved and the number or character and/or words? That online tool is awesome! I can use it in future if I am comparing some text files and I don't want to upload them to Wikipedia. Yes. Balancing false positives and false negatives is tricky. I have an idea, but I don't know how easy it would be to implement. At the moment, you reject blocks if they are smaller than a certain amount. Could you also take distance moved into account? e.g. to accept a block, distance moved has to be less than three times the size of the block, unless the block is greater than five words long, in which case it can move as far as it likes. I've used the improved inline diff as my primary display of changes since the day I discovered it was available, and had been very happy with it; but recently I've become more and more frustrated at having to re-learn the display conventions every time I sign in to Wikipedia. The “obvious” red-and-green color code for deleted-and-inserted words changed to red-and-blue. Its position after the traditional diff display changed to a position before. Moved text changed from a highly-visible yellow highlight to an almost invisible, and thus useless, faint gray. Now the new well-saturated red-and-blue has changed again, today, to something involving washed-out blue and yellow. I can't speak for Cacycle, but I imagine these things will stay stable now. 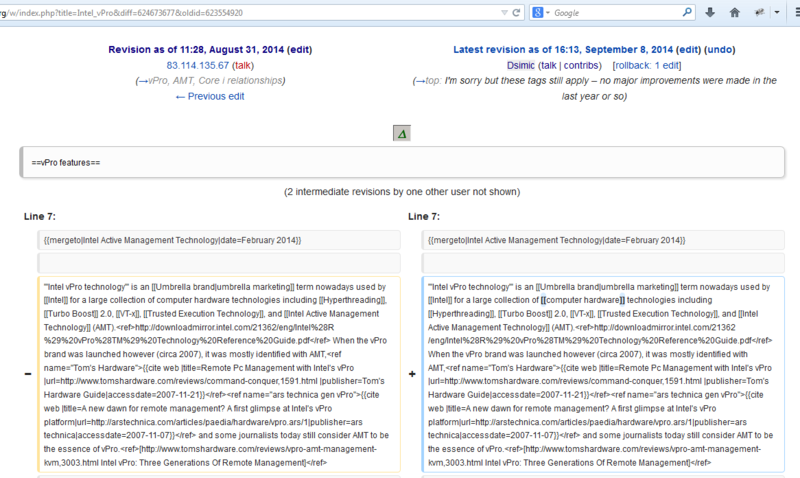 The new colours reflect the new(ish) standard in the default MediaWiki diff. I like them, they are less painful to the eye. I also like the new location of the diff because it means I don't have to scroll past the default diff. I don't know if Cacycle has tried a few shades of grey recently, but I find the grey moved text easy enough to see. Do you still find it difficult? The reason for NOT using a red/green scheme is responsive design for colorblind users (8 % of males!). The skin/sky colors have been optimized for color contrast for these users. Moving wikEdDiff up makes it more prominent and visible without scrolling. This also reflects the maturity that the library has reached: it is essentially as reliable as the default diff and, hopefully, much easier to understand. I have switched off the rainbow colors to identify block/mark pairs so that the new black-on-skin/sky color scheme could be used. This is a major improvement because you now have the same color code for default and improved diff. I have tested the shades of gray on different monitors and using different backlight intensities and it seemed to be a good compromise, especially together with their bold style. Instead of the color coding, there is the new block/mark highlighting if you move the mouse over them. By left-clicking you can even jump between them. Earlier today I spent some time on a watchlist entry trying to discover what an editor had changed. The improved inline diff showed nothing obvious. 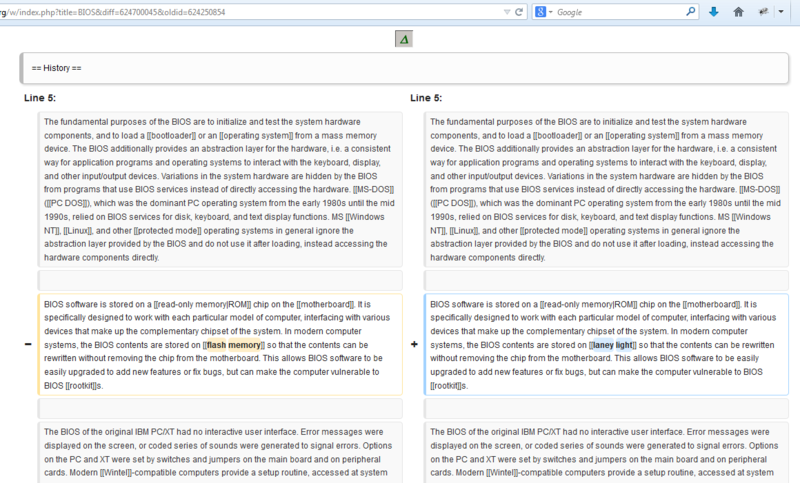 But the old, baseline diff showed a big difference, with whole paragraphs changing their sizes as a result of the edit. It turned out that the editor had deleted an extra newline which had broken a paragraph into two. The old baseline diff showed one entire paragraph deleted and the preceeding one extended, with all of the relevent text in bold, twice, making it obvious. Using that old diff as a guide, I searched the improved inline diff and discovered one blank space which, rather than being colored white like the others, had been colored in slightly-yellowish off-white, the current color for “deleted”, and which unfortunately is the closest thing to being invisible. Oops. More vivid and saturated colors, such as the ones used earlier, would have completely eliminated the problem. Of course, I'm sure that preference of colors will vary between editors, with the case of color-blindness an obvious example. My fix was to use the Firefox HTML inspector to show the span class names, then restore the older colors in my “common.css” style sheet. While I was there, I also set the newlines to appear as “¶” again. Oh, and I actually prefer the new inline diff appearing first, as it does now — it was just disorienting to scroll down by habit to where the Δ button had always appeared, only to find it suddenly gone. If all is stable again, I have no complaints, and a hearty Thank You for making this enormously-helpful tool available. @Cacycle: After using customized colors for a while, I've spotted something that looks like a small bug... In a few words, everything works great regarding customizing the colors, except for what's displayed as one-character changes; for such changes, custom colors are applied as expected when a wikEdDiff is initially displayed (as seen here, for example), but the default colors are erroneously applied to detected one-character changes whenever the mouse pointer is placed anywhere inside frame-fenced sets of changes (as seen here, for example). This looks like a particularly odd false positive. A single character (n) is shown as moved several paragraphs. - "Reject blocks if too short and common"
- "Words: reject blocks if shorter"
...but could not see any effects. Are these non-functional in the online demo? Also, the "moved text" recognition is too sensitive in some cases (it detects single words erroneusly as moved that are actually edits). Is there something that can be done such that only whole blocks of text are recognized as moved but not single words? Hi there. First off, thanks for this great piece of software. ... does not reflect the content of wikEdDiff.js: There is no mention of wikEdConfig og the diffCSS property in the code. There is, however, mention of a wikEdDiffConfig that is assumed to be a global variable. If this one is present, it will be deep-copied into this.config. This seems the most likely interpretation. It seems that there is only one property related to styling called stylesheet that contains a string of all the style. If one wants to change the styling, one has to add a <style /> tag and write !important in case the styling conflicts with the default, or completely redefine the stylesheet property of the config. It would be nice if there was something in-between like the documentation suggests. I.e., if a CSS property is listed, use it, otherwise use the default. Just a suggestion. Also, why are there both the classes .wikEdDiffDeleteBlank / .wikEdDiffInsertBlank and .wikEdDiffNewline and .wikEdDiffSpace? From the internal variable regExpBlanks, I would assume it has to do with unicode-compatible whitespace detection. Is this because one should be able to differentiate between regular spacing and unicode spacing? I've been playing with this handy tool and testing it with large texts (300kb), with mostly great results. a 'clear' button. I added it easily to my local copy by cloning the 'example' code. 'Load file' functionality, besides copy/pasting. Would be great, particularly if filenames also appeared (color-coded) heading the result. 'Case Insensitive' option. A must for some situations. I've also noticed IE9 hogged the CPU after diff was complete, becoming mostly unresponsive, while up-to-date FF worked flawlessly. where a, d and m are additions, deletions and moves, respectively. I'm not saying the above cost function is perfect. It can probably be improved just by thinking about it and could definitely be improved by trial and error, once such a system has been developed. Using this approach would mean than calculating a diff would be an optimisation problem. There are many ways to solve optimisation problems. For example, we could try calculating the diff using several existing methods and then just use the version that gives the lowest cost... but it might be more clever to use an iterative approach. "Use of "wgServer" is deprecated. Use mw.config instead." On all pages I visit on Wikipedia, I get the following in my Console: "Use of "wgServer" is deprecated. Use mw.config instead." I'm guessing it's probably this script? Since it gets the wg variables directly, rather than through mw.config.get. Any chance the script could be updated to use mw.config.get? Hello, I have ported the great wikEdDiff library to Python: python-wikeddiff. 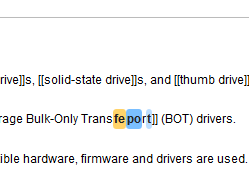 Is it OK to use "wikEdDiff" as part of the port's name? Should I change anything else in the description or licensing? Are you also interested in simplifications of the data structures and algorithms to possibly make other ports more easy? For instance, there is no direct counterpart for null in Python (and many other languages) and mixing true, false and null for assumably boolean variables (e.g. the .fixed property of groups) is probably not the greatest idea. I think that the only relevant place (the main loop in the insertMarks method/function) can be fixed by considering also the .oldNumber property in addition to .fixed (see ). still I would like to get it without the debug mode, any suggestions? Might be there any conflicts with other extensions or libraries? wikEdDiff is on the fritz. 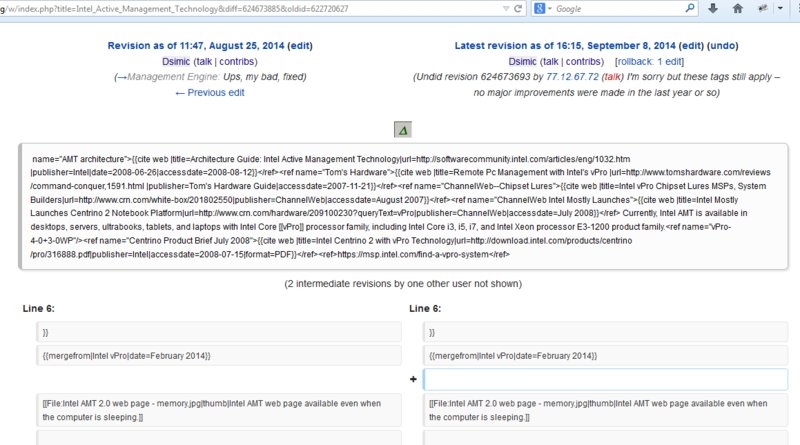 Go to any English Wikipedia talk page → click on New section link at top of page → click on the Changes or Show changes button at the bottom of the edit window → enable wikEdDiff → page appears to be blanked. Trouble report: wikEdDiff is erroneously reporting "no difference"
Hi! You are receiving this message as it looks like you have a copy of the WikEdDiff user script in your user space on this wiki. When using the RevisionSlider and WikEdDiff together WikEdDiff will not function correctly when the RevisionSlider is used to load a new diff. This can be fixed by adding a simple hook listener to your copy. You can find the relevant phabricator ticket here which contains the code that you will need to add to your copy of the script (in most cases). Please also use this ticket for further questions & discussion. Is It Possible for wikEdDiff to Show Differences Without Wikitext and HTML Markup? About a month ago, I switched from Firefox to Pale Moon, a fork of that project. Since then, wikEdDiff doesn't work—which I consider strange, because wikEd doesn't seem any different. None of the other Wikipedia preferences, gadgets, or scripts I have seem to have been impacted negatively by the change in browsers. When I click on the button with the green triangle to show the improved diff, the text box opens with three dots in it. In Firefox that would last a second or so and the diff would appear in the text box. In Pale Moon, nothing happens except that the cursor spins if I hold it over the button with the green triangle. If I click on the button again, the text box closes and the cursor stops spinning. Warning: Error in parsing value for 'background-image'. Declaration dropped. Warning: Expected 'none', URL, or filter function but found 'progid'. Error in parsing value for 'filter'. Declaration dropped. Warning: Unknown property 'zoom'. Declaration dropped. Warning: Expected ';' or '}' to terminate declaration but found '!'. Declaration dropped. I've never looked at the Error Console before, so I don't know if I've had warnings in the past or if that's something new to Pale Moon. Highlights in old and new versions? ignore white space changes - to reduce trivial change clutter - an option? ignore (or otherwise indicate) capitalisation changes - to reduce trivial change clutter - an option? This page was last edited on 16 November 2018, at 04:34 (UTC).